Holy Family School recently participated in Computer Science Education Week. It was held the first week of December and Holy Family has been a part of it for the last 5 years. Like so many schools across West Baton Rouge, the Diocese of Baton Rouge, the state of Louisiana and even world, this is primarily done in celebration with Hour of Code Week. Computer Science is changing every industry on the planet and it is important that every student is given an opportunity to not just use technology but learn how to create technology as well. With our ever-changing industries; computing knowledge has become part of a well- rounded skill set. Computer science drives job growth and innovation throughout our economy and society. Coding and other computer science concepts help nurture creativity and problem-solving skills to prepare students for any future career. 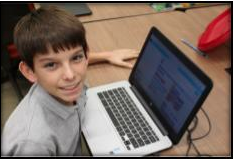 Through Hour of Code, all Holy Family students from PreK-4 up to 8th grade, worked on critical thinking, problem solving, measurement, digital creativity, technology operations, logic and computational thinking. The Hour of Code is an introduction to computer science, designed to demystify code and show that anybody can learn the basics. Hour of Code is fun and provides an inviting introduction to programming that can provide a myriad of benefits for kids. Everyone talks about the job market as the big reason to learn programming, but the benefits go far beyond potential career preparation. 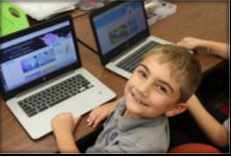 For Holy Family students, programming is a great way to improve their thinking skills. Coding requires and instills discipline, attention to detail, patience, the ability to predict an outcome, and many other valuable skills. These thinking skills can help Holy Family students in all aspects of life – not just programming. Of course, the job market is a pretty good reason to learn too.